I love owls! Don’t you? Here are some picture books about these rare and fascinating birds! Late one winter night a little girl and her father go owling. The trees stand still as statues and the world is silent as a dream. Whoo-whoo-whoo, the father calls to the mysterious nighttime bird. But there is no answer. Jane Yolen has created a story depicting of the special companionship of a young child and her father as well as humankind’s close relationship to the natural world. Owl couldn’t sleep–not while the bees were buzzing, the crows croaking, the starlings chittering, and the jays screaming. Every time there seemed to be some peace and quiet, someone else landed in the hollow tree and woke Owl up again. Would Owl ever get any rest? A young girl and her grandfather look for a barn owl night after night. Will a distinctive heart-shaped face appear at the window? 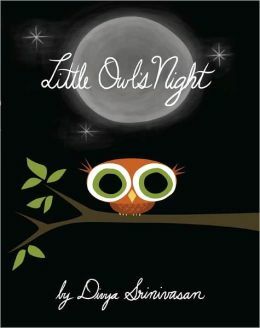 When Little Owl oversleeps one night, she wakes to find that all the other owls have gone off without her. 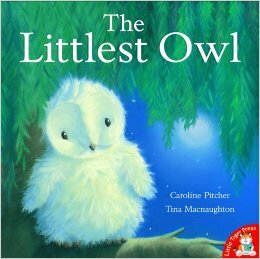 Soon she befriends a little boy named Tom who helps the sleepy little owl find plenty of playmates. Plop, the Baby Barn Owl, is like every Barn Owl there ever was, except for one thing—he is afraid of the dark. “Dark is nasty” he says, and so he won’t go hunting with his parents. 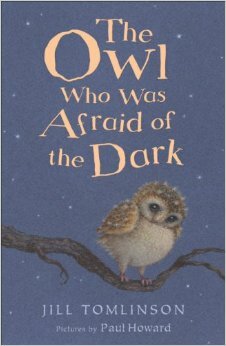 Mrs. Barn Owl sends him down from his nest-hole to ask about the dark and he meets a little boy waiting for the fireworks to begin, an old lady, a scout out camping, a girl who tells him about Father Christmas, a man with a telescope, and a black cat who takes him exploring. He realizes through these encounters that dark is super after all. Deep inside a willow tree, three newly hatched owlets await the hatching of the fourth egg, wondering if there is another owlet in there. When at last he emerges, he doesn’t look much like the others. Being dumpy, small & downy white, he is left behind while the others learn to fly. Will he ever learn to fly? The owls are born in the midst of many other lives in and around the barn: spiders spinning, snakes sunning and shedding, and the busy bees. The color of the illustrations speaks without words, giving added beauty to this book. 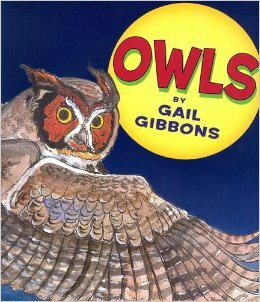 Gail Gibbons explores the mysterious world and workings of owls in her latest nonfiction picture book. 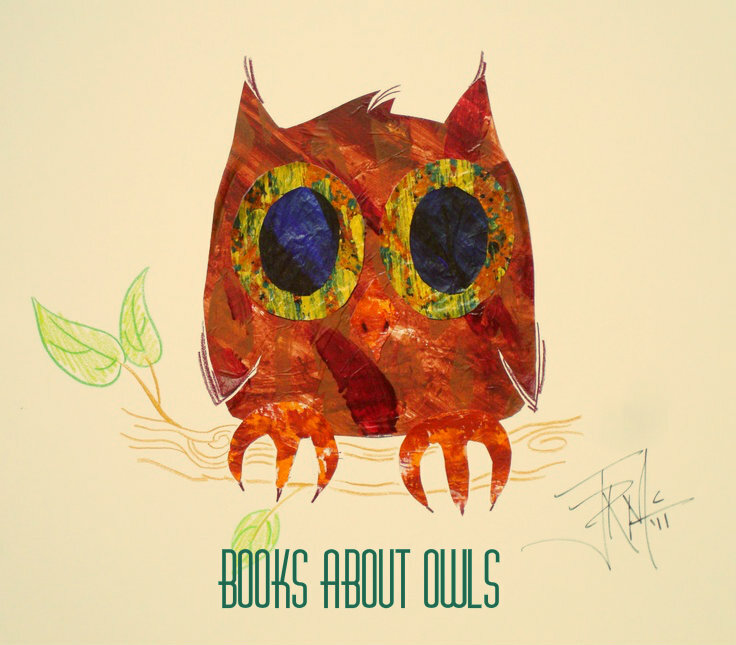 She depicts numerous species of owls and discusses their biological similarities as well as their differences. She portrays their ideal habitats, life styles, birth and development and environmental hazards that are threatening certain species. As usual, her comprehensive text is accompanied by clearly labeled illustrations and diagrams. Definitions are also included for additional clarity. When three baby owls awake one night to find their mother gone, they can’t help but wonder where she is. What is she doing? When will she be back? What scary things move all around them? Not surprisingly, a joyous flapping and dancing and bouncing greets her return. Whoooooo’s saying good night to owl before going to sleep? In Goodnight, Owl, readers will lift the flaps to see Owl saying goodnight to his woodland friends.